“My soul could not stand the cries.” That’s Russian man Anatoly Tuptey speaking with The Siberian Times after the animal-lover braved treacherous conditions to save to kittens trapped in an oil spill. “My soul could not stand the cries, I went to see. You never know what is going on, I had to check,” said Tuptey after an oil spill in Nefteyugansk, Russia (we can’t pronounce it either). 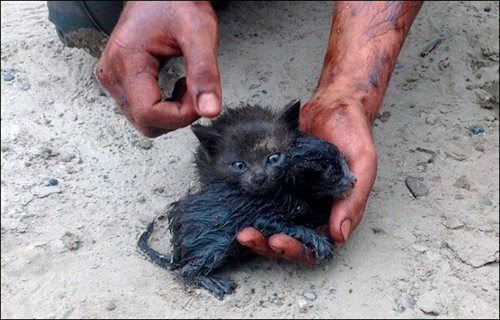 Tuptey reportedly waded into the oil to rescue the kittens then, using his t-shirt, dried them off and kept them warm. Tuptey said he brought them home, cleaned them and fed them. Because of Tuptey’s bravery, the kittens are happy and healthy, have a loving home, and even a new friend. Tuptey’s pet dog seems to like them just fine.